Since the release of their debut self titled album back in 2001, Finland's Ensiferum have found themselves to be regarded as one of the best viking / folk metal bands on the scene. Victory Songs is the band's third full length in 6 years. Victory Songs opens with one of the most beautiful introductions I have heard in a long time. It was surprising because there aren't any folk influences to be heard at all; instead it has the hallmarks of the instrumental pieces performed by bands like Summoning. It is a sweeping, atmospheric track that sets the mood impeccably for what is about to follow. With the mood appropriately set we are re-introduced to familiar territory with Blood Is The Price Of Glory which is exactly what you would expect to hear on an Ensiferum album. It is a black metal tinged and melodic folk track with an array of double kick patterns, keyboard melodies and sing along vocals interspersed with the lead black metal vocals. The sound established in this song is more or less where the rest of the album stays. Unlike many of the other bands who dabble in this subgenre, Ensiferum seem to have struck the perfect balance between their folk influences and their black metal influences. The end result is an album that never swings too far in either direction and sounds completely centred. I would hazard a guess that a lot of the popularity they enjoy is due to this balancing act. The musicianship on display is amazing. That the band are able to weave black metal riffs into something that sounds true to both of the genres they are embracing is a tribute to their skills as song writers. Even with the obvious black metal influences the overall feeling of sitting around a camp fire, drinking beer and singing aloud is never lost. In addition, without knowing much at all about European folk music, it is impressive that the vast majority of the music is played at quite a quick pace yet still manages to sound authentic. A big part of the listener's enjoyment will stem from their ability to digest large amounts of folk inspired black metal. Whilst I recognise the amount of talent that is present on this album I found my interest waned towards the end of the disc. Not because the quality dips for a second but because folk metal isn't all that appealing to me and there are nearly 50 minutes of it on Victory Songs. 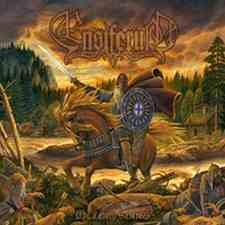 That Ensiferum as a band are immensely talented is undeniable. The real question is whether or not folk metal is your thing. I found a lot to like on this disc but also had my issues with it because of its overtly folky nature. If bands like Isengard, Storm, Finntroll or the myriad other folk metal acts out there do it for you then Victory Songs will serve as an excellent addition to your collection.